Vikings linebacker Brandon Watts (58) works on drills at Winter Park during a practice late last spring. 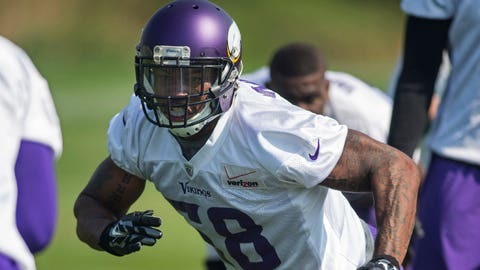 The Vikings made multiple roster moves on Tuesday, highlighted by the team’s signing of linebacker Brandon Watts to the active roster from the practice squad. Additionally, Minnesota placed cornerback Jabari Price on injured reserve, signed fullback Blake Renaud and linebacker Terrance Plummer to the practice squad and released receiver Donte Foster from the practice squad. Watts is a second-year linebacker who joined the Vikings after a decorated college career at Georgia Tech. The 6-foot-2, 231-pound 24-year-old was drafted by Minnesota in the seventh round in 2014 and saw limited action last season. Price entered 2015 viewed as a promising second-year cornerback, but was slowed by an early two-game suspension and injury. Renaud, 23, was a celebrated linebacker as a collegian at Boise State and is making the transition to playing fullback as a pro. Foster has one year of NFL experience after playing at Ohio as a collegian. The true newcomer to the Vikings among the aforementioned players is Plummer. The rookie linebacker played collegiately at Central Florida, and eventually spent time with the Redskins after going undrafted last spring. He played middle linebacker for Washington during the preseason, finishing third on the club during exhibition play with 12 total tackles. Plummer was one of Washington’s final roster cuts and was signed to the Redskins’ practice squad on Sept. 6 and was eventually active for three games before being waived on Oct. 5.